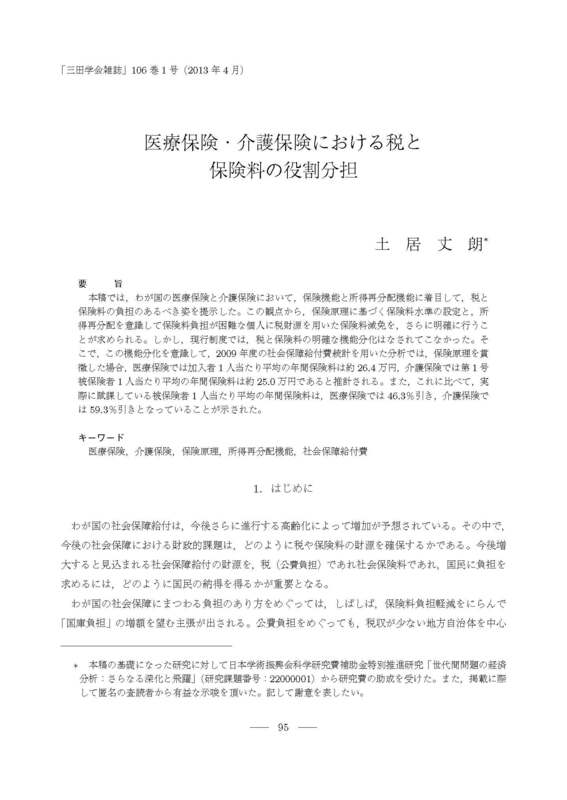 This paper focuses on the insurance principle and income redistribution functions in public insurance of health care and long-term care, and investigate how the burden of taxes and insurance premiums should be set in Japan. Benefits of health care and log-term care insurance are financed by taxes and premiums. However, differentiating functions between taxes and insurance premiums in the current system is not established clearly. From this perspective, the establishment of premium levels based on the insurance principle and the reduction of insurance premiums using individuals as tax revenue resources, who can ill afford to bear the burden of insurance premiums, require further elucidation. Given this functional difference, an analysis, used "The Cost of Social Security in Japan" in fiscal year 2009, estimates that if the insurance principle fully prevails, the average annual premium in health care insurance per subscriber is approximately JPY 264,000, whereas in long-term care insurance, the average annual premium per Category I insured persons who are 65 years old or over is approximately JPY 250,000. In comparison, this study indicates that the discounts on average annual premiums per insured person actually levied are 46.3% for health care insurance discounts and 59.3% for long-term care insurance.